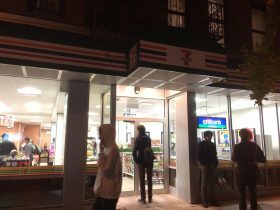 It happened on Halloween: 7-Eleven opened at the corner of Avenue A and East 11th Street, to the, em, horror of many an East Villager. Or at least, to the horror of the folks who’ve been protesting the store’s construction site every Sunday: No 7-Eleven is calling for a 9 p.m. boycott rally tonight. “We had a couple of people come by today and say they were really happy,” she added. And then another clerk told some trick-or-treaters they were out of candy.